Dorie describes this recipe as a variation of chef Michel Richard's play on the classic spaghetti carbonara. Since I have never tried the latter I cannot comment how the two compare in taste. All I can say is that onion carbonara is a very easy and tasty dish. All you need to do is steam the onions until they are just "al dente". Then saute the steamed onions with bacon bits and cream and finally dress it up with a yolk and cream sauce and a drizzle of Parmesan cheese. The process takes less than 10 minutes (provided you have bits of precooked bacon in your freezer) and the dish tastes amazing when served as a side with spicy chicken and plain rice. I had cooked half of the recipe and immediately afterwards had a small portion for lunch. I liked it but was not overly excited. But when I had the chilled version for dinner, I realized why Dorie spoke so highly about it. Funny Dorie suggests serving it as soon as the yolk and cream dressing is added... I really enjoyed the chilled version better. 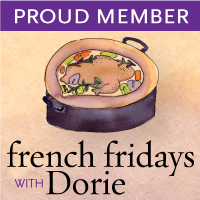 Visit French Fridays with Dorie to know what the other members thought about onion carbonara. You can find a version of the recipe here . As I mentioned I cooked half of the recipe and used fat free sour cream in place of cream. For Dorie's original recipe and more such delicious ones order your copies of Around the French Table from Amazon or from The Book Depository and join us as we cook our way through the book. Now I'll have to try the chilled version! 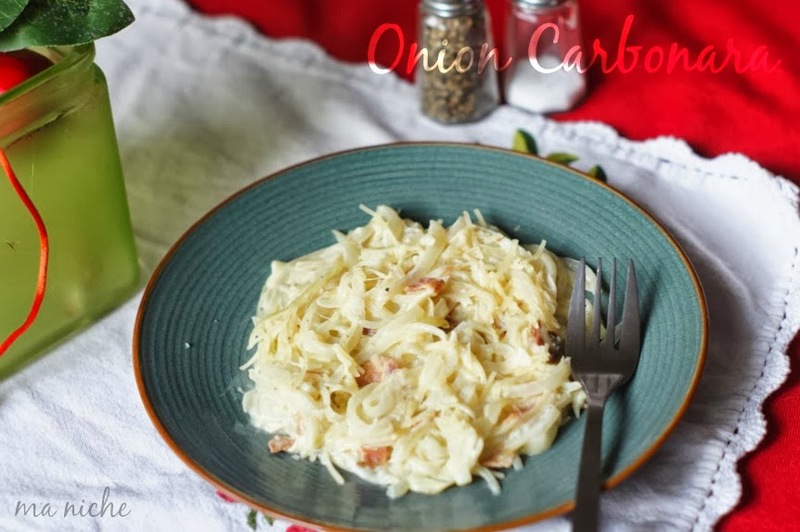 Your Onion Carbonara looks fabulous! Thanks so much for sharing your awesome recipe with Full Plate Thursday and have a great weekend!